My name is Robert Parris. I currently live near Toronto Canada and I've been practising magic for pretty much my whole life (I'm in my 40's now). I am mainly a fan of coin magic and can almost say it's almost an obsession I am a fan of all the coin greats like Latta, Harbottle, Gallo and Dill but my favorite has to be David Roth. My favorite all around magician is of course Juan Tamariz. I'm happy to see another forum dedicated to the love of magic and can't wait to get into some fun and intense conversations! Hello everyone...happy to be here and I'll be looking forward to some interesting discussions and idea sharing. Hello All. I am an Amateur/Hobbyist Magician of intermediate skill. I like card tricks Paddle tricks and a few other things. I don't do much with coins unless it's really easy lol. I have been doing magic for 15 years and still enjoy it. I only show to friends and family and have no desire to do it professionally as it just doesn't interest me. I live in North Wales but come from London originally and I support Tottenham Hotspur football club. Hello All. I too am looking forward to participating in this forum and sharing our love for the art of magic. Hello - Oscar Hills here. I'm an amateur who has been studying card magic as well as a few other things for nearly 50 years. I love magic, and I look forward to trying too help this place achieve a critical mass of activity. That will require a lot of work. Fwiw, I have been on the Internet from the beginning, and have participated in and been the administrator of innumerable forums. They're easy to start, but hard to sustain. I hope it can happen here, because the negativity people are referring to is definitely embarrassing to the rest of us, I think! Currently living in upstate NY. Part time pro - Festivals, busking, private parties, bizarre and seance. With my wife, Colleen the Sideshow Queen: perform as Psychic Sideshow - festivals, private parties, corporate, organizations, and haunted attractions. Thanks for the introduction, Dodd! It's nice to meet you. I've heard of the Magic News Wire and think I may have even heard your interview with Harru. But I'm about to go and check it out right now! I'm looking forward to getting to know you better! I am happy to be a part of this new forum. Looking forward to learning and (where I can) helping and participating. Wow!! Just a quick glance at your website and I was impressed with the list of guests that you had on your show. Consider me a subscriber! I imagine you had the last interview with Barrie Richardson before he passed away. I look forward to hearing it. Looking forward to being a part of this forum. I will read, help (where I can), and participate. Thanks to Mr. Lorayne for alerting me to this forum. And to whoever is maintaining it. Thank you for joining us, Jim! I'm honored for you to be here. Robert Toomer here, Thanks to Harry Lorayne for letting me know about this site. Currently living and working with my wife in northern Alberta Canada. Card magic only- have been into it for about 40 yrs. Just a hobby never have made money doing it- just love it. Once again thanks Harry. Thank you for joining us! Welcome to the Magician's Forum! I'm always open to feedback on how I can make this forum better, so please feel free to contact me with any suggestions. My name is Dan Waterman...originally from upstate NY and now residing in Forest Grove, Oregon (I am proud to personally know our moderator Rudy both as a fellow magician and very good friend). I love all magic. I tend to lean towards close-up and enjoy learning moves and sleights as well as funky gaffs and gadgets. I have over twenty years of part time performing experience and am excited to share ideas and experiences with all who enter this site. Hi everyone, I'm Craig from Glasgow, Scotland. I was directed to this forum by Harry Lorayne and look forward to reading the posts and hopefully contributing to the discussions too. Im a card magic lover but have never took it any further than a few friends and family. I enjoy watching Magic and also enjoy reading about it. My last book purchase was a signed copy of Harry Lorayne's Classic Collection so I have plenty to be reading for now. Thanks for joining me here, Dan! I'm honored to count you as a friend! Hi everyone, I'm Craig from Glasgow, Scotland. I was directed to this forum by Harry Lorayne and look forward to reading the posts and hopefully contributing to the discussions too. Im a card magic lover but have never took it any further than a few friends and family. I enjoy watching Magic and also enjoy reading about it. My last book purchase was a signed copy of Harry Lorayne's Classic Collection so I have plenty to be reading for now. It's nice to meet you, Craig! Thanks for joining us! I look forward to getting to know you and discussion all things magical! Looking forward to some wonderful magic insight here at the Magic Forum and being part of Harry's world....Not only am I a fan of Harry but a practitioner of many of his memory techniques especially from the renowned Memory Book. Thank you Harry for being a big part of my magic upbringing and magicians circle for many years. Thanks for joining us, James! I used Harry's memory techniques to memorize the Tamariz stack. I can't imagine doing it any other way! Nice to meet you, Helder! Welcome! Wow! You've been studying magic longer than I've been alive (I'm 42). Welcome to the Magician's Forum! I look forward to learning from you! It's very nice to meet you, John! Thank you for joining us! Welcome, Jim. It is a real pleasure to see you here. Hi, my name is Paul Mellan and I was justintroduced to this wonderful forum through Harry's email! Thank you Harry. I own Mel's Magic City, a brick and mortar magic shop, in Scranton, Pa. I have sold Harry's books for at least thirty-five years with good success in a small town. His magic is top notch! I am very saddened to hear of the Cafe banning him. Hi everyone! I just got the email from Harry Lorayne about this forum and came right away. I'm new to magic, having only started in November of 2014 - at the age of 50 no less! . My main passion from the start has been coins. But I also really like cards and cups and balls. I'm in San Antonio, TX and hope to continue with magic being a huge part of my life for years to come. Yes. Barrie joined me in 2009. It is a long story, but the hosting provider that I originally used to archive the podcasts closed its doors with no notice. I managed to get most of the shows back online quickly, but have found several recently that I thought had been lost.. hence the recent uploads which are out of order. New one coming soon with Armando Lucero. Wow! You've been studying magic longer than I've been alive (I'm 42). Welcome to the Magician's Forum! I look forward to learning from you! Haha. Well, I'm no scholar, but I've spent plenty of money on the literature, so I know a little, to paraphrase an old southern rock tune. Welcome, Robert, I spent quite a bit of time working in northern Alberta. Glad to have you here. Welcome Robert, Im from near Toronto myself. I look forward to chatting with you sir. Welcome Paul! I love Brick and Mortar shops and still frequent them for most of my purchases. Thanks for joining the Magician's Forum!! 50 is the new 30 my friend. You have a nice, long journey ahead of you. My name is Paul. I currently live in Northern California, but grew up in Buffalo, New York and was lucky enough to spend a lot of time at the Forks in the 70's. I met Karl Norman (who lent me magazines), Eddie Fechter, Gene Gordon (IBM#1---who was still teaching magic back then), Jay Malbrough, and Allen Hayden among others. Allen did a Triumph back then (with a Z*****, before I knew what that was, I was looking for the Vernon method) that was amazingly clean. He's also a very funny guy. There used to be an ice skating rink right next to the Forks and I'd drop in after hockey occasionally. A great memory is seeing Eddie work for 1/2 the Sabres professional hockey team at 3:30 in the afternoon after a practice. Flying Eagles was a masterpiece in his hands. I love card magic and card magic books, especially: Lorayne, Tamariz, Aronson, Regal, Richardson, Cervon, Close, and Ortiz. My favorite book might be Reputation Makers, but Simon Says and Mnemonica are close seconds. Probably the most amazing performance I've ever seen was Tim Conover doing mentalism at an A-1 (I think) convention. I've been on Harry's mailing list since 1970 or so, I think. Still have a folder of the famous typed postcards he used to send out. When I sent him handwritten letters, they'd come back with the answers typed over my original letter or in the blank spaces. He understands efficiency. Glad to see another Magic forum. I was a great fan of Dennis Loomis, who I never met even though he lived nearby, but contributed immensely to the Magic Cafe forum and was always helpful, knowledgeable and gracious. Thank you for giving us such a wonderful introduction to who you are. Amazing that you've been on Harry's contact list for more than 40 years. Wow! I look forward to gleaning much wisdom and insight into this wonderful art that we love so much. I'm glad that you're here at the Magician's Forum. I am an avid amateur hobbyist magician in the truest sense of the words. In other words I am not a professional magician and I do not perform formally or commercially. Here's a summarized version of my magic background; hopefully you won't become too bored before getting through my post. I developed an interest in magic in the late 1970s when I worked in Philadelphia. I used to spend my lunch hours rotating between a couple of great magic shops: The Magic Center and Jack Chanin's Studio of Magic, neither of which are still around unfortunately. I then started traveling quite a bit - and working much more than I should -for my career in construction and engineering management and didn't return to the Philadelphia area until the 1990s. Twelve years ago I became disabled and I am no longer able to work. In 2007 I rekindled my interest in magic and have been working at it ever since. Mostly coin magic but also most other categories of general close-up magic: sponge balls; ropes; finger ring and string/rod; rubber bands; chop cup; and some card magic. I don’t perform any magic commercially - I occasionally perform for family and friends, usually at family gatherings. I am not as confident as I would like with a lot of the sleights I use and I refuse to perform anything at all unless I am extremely confident that I can perform it close to perfect. That severely limits what I do perform, but it does mean that what I do perform I do very well! But I digress - and I'm afraid I have really gone on far too long here. I apologize for that but it is rare anymore that anyone offers me the opportunity to talk about myself! Dorian Rhodell reporting for duty. Looking forward to the discussions here. Dorian Rhodell, I am honored to have you here at the Magician's Forum! Your knowledge, experience and passion for magic will be an incredible blessing to this community. Hello, and thanks for Harry Lorayne for letting me know about this forum. I'm a college professor and long-time hobbyist, and I'm busy reigniting my love for magic as a reward for having finished up my doctorate. Looking forward to learning from folks here. Welcome, Dorian. Very happy to see you here. in northern Virginia just outside Wash. D.C. I moved here 3 yrs ago from Las Vegas. for the invitation to join and participate in this group. Good hunting everybody! - CIAO. Thanks for joining us, Lew! Many of us are very familiar with your name. I'm looking forward to getting to now you better here at the Magician's Forum! I'm so glad that you've joined us, Doug! I look forward to getting to know you better as we build this new magic community! No need to apologize for telling us who your are and sharing your passion for magic! Thanks for joining us here at the Magician's Forum. With 100 magic books in your possession, I imagine that you're going to be a great asset to this community! Thanks for the introduction, Raz! I look forward to getting to know you better! Hello all! Been practicing card magic since I was 6. Fast forward 28 years and I'm still practicing! First forum that I have ever joined thanks to Harry's email. Hope to be a part of this new forum and help out when I can! Thanks for joining us! Harry has been a huge influence on many of us and I'm grateful to him for all his contributions to our art. I'm also grateful to him for helping to promote this new forum for magic lovers around the world. I look forward to getting to know you better chefzorba! My name is David and I'm an accountant in Essex, a UK county just north-east of London. I've since branched out into a few other areas of magic; coins (simple tricks only - I find coin sleights much harder than card sleights), cups and balls (a simple but effective routine which always gets a great reaction) and a few other close-up items. I do a couple of routines which play a little bigger such as rope magic (mainly Pop Haydn's Mongolian Pop Knot) and silk to egg. I have a few others lined up which I have not unleashed on an audience yet as I want to get them firmly rehearsed first. I enjoy magic forums but it will be good to be part of one which is troll-free. When I see some of the garbage Harry has to put up with it makes my heart sink. Good luck to everyone involved here. Hello all I'm Stez and I've been practicing card magic for about 2 years now. My favourite magicians (and the ones I've been influenced most by) are Pete Firman, Luke Jermay and Harry Lorayne. 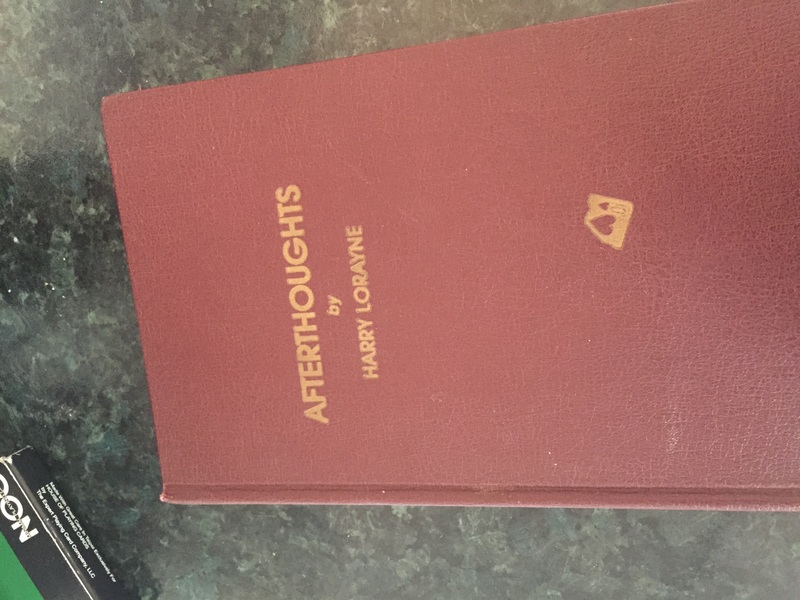 Unfortunately I've only had the pleasure of reading one of Harry's books - afterthoughts, from which I learned my favourite utility sleight- the halo cut. Look forward to talking magic with you all. Big thanks to Harry for his email. So sorry to hear he has been banned from the MC. I always felt ostracised for having AOL as my server and not being able to comment. Some of the stuff Harry put up with on there was disgusting. I have been into magic for 30 years now, close up magic being my preference. Looking forward to reading and hopefully commenting on some great topics here.